Organic virgin coconut oil can be an absolute boon for anyone looking for a healthy head of hair. Chalk full of healthy fatty acids work to penetrate our hair and reduce protein loss. This goes a long way in keeping a strong, shiny and great looking head of hair. The process of using this oil as a conditioner is something worth trying for almost anyone. Polynesian and South Asian women have been using if for generations and maintain beautiful heads of hair for long times. I’ve known it to be true. Good things take time. Finish up a nice shower and make sure that you shampoo your hair while you are in there. Let your hair dry to the point where it is still slightly damp. You are going to use the oil as a leave in conditioner treatment. This will take 1 hour, but it is extremely beneficial. You will quickly notice that the right coconut oil is white in colour and solid at room temperature. This is a good thing. This oil has a heating point around 24 degrees Celsius, and therefore needs to be warmed before application. The oil can easily be heated in between your hands as you rub them together. Place approximately a quarter sized glob of the oil into your hands and work it between your hands until it is a liquid. Note: Refrain from using the microwave to heat the oil. You can run the bottle under a hot tap, but microwaving alters a lot of the good stuff in the oil. Now that the oil is melted you need to work it into your hair. Begin at the tips and massage it gently into the entire hair down to the roots. If you need more oil, prep some more and let it rip. We all have different heads of hair and learning the right amount will help you out. 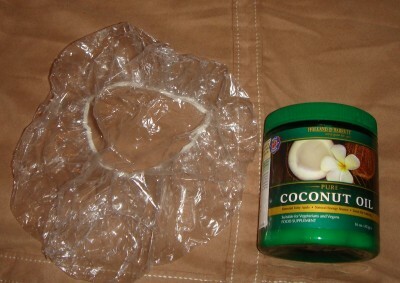 Cover your head with a shower cap if you have longer hair or if you just wan't to try it out. The heat that is retained helps the oil do it's thing. Relax around the house, read, or take the time to do anything you can. Thoroughly rinse your hair with water. Taking the time to rinse your hair and remove all the excess oil will leave you with a great looking head of hair when it dries. Most people will find doing this once a week is just right. Some do not need the treatment as frequently and others may require more coconut love.